Or at least, it’s a very common question in my office this time of year. 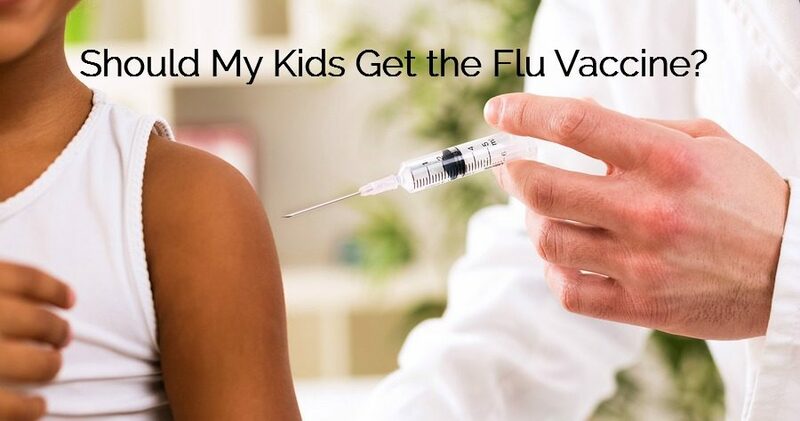 I believe that the decision to get the flu vaccine for your child, just like any other vaccine, is YOUR CHOICE as a parent, and it’s a very personal choice with many factors that have to be weighed. This decision must be made on an individual basis, taking into account the unique healthcare needs and concerns of your child. Before we dive into the flu vaccine, let’s take a look at the flu itself. Influenza, or the “flu”, is caused by any of a number of influenza viruses. There are several other non-influenza viruses that circulate during the winter and cause upper respiratory infections and influenza-like illnesses, but the “flu” refers to those illnesses actually caused by the influenza virus. Symptoms of the flu can range anywhere from mild cold-like symptoms, to high fevers, chills, fatigue, sore throat, runny nose and cough, headache, body aches, and vomiting/diarrhea. However, it’s important to note that less than half of those infected with the influenza virus will actually develop flu symptoms, and most people will have a relatively mild illness. While there are certainly people who get very sick and have complications from influenza infection, the vast majority will not have an illness anywhere severe enough to even consider hospitalization. Most people who get the flu will recover within days to 2 weeks without any complications. Patients who are more likely to have serious complications from the flu and be hospitalized are young children less than 2 years of age and adults who have associated risks, which include being over 65 years old, pregnancy, asthma, chronic lung or heart disease, diabetes, immunosuppression due to disease or medication, morbid obesity, and neurologic or neurodevelopmental disorders. According to the CDC, the flu vaccine reduces the odds of getting the flu by about 60%, but that number varies quite a bit for different populations. The flu vaccine will only be effective if those people receiving the vaccine mount an appropriate immune response. While 97% of adults ages 18-64 years given the vaccine may show protective levels of antibody titers at 21 days after vaccination, the same isn’t necessarily true for children. At 10 days, the antibody response to the flu vaccine in kids under 9 years of age is found to be much lower. The low response in children under 9 years of age accounts for the recommendation that children 6 mos – 9 years who are receiving their first flu vaccine receive 2 doses of the flu vaccine approximately 1 month apart. Effectiveness of the flu vaccine also depends on what flu strains are circulating that year. As you may be aware, the flu vaccine is made by trying to predict the 3 or 4 most prevalent flu strains that will be circulating the following year. Some years, none of the flu strains in the vaccine match the circulating flu strains. Other years, they have a better match. I have been closely monitoring the CDC’s Weekly U.S. Influenza Surveillance Report with weekly updates of national flu activity (which lags by 1-2 weeks), to see whether the flu vaccine is a good match this year. Is this year’s flu vaccine a good match? One case of a novel Influenza A (H1N2) virus was identified – a totally new swine flu mutation. BUT no need to panic, it doesn’t look like we are heading back to the swine flu “epidemic” days. The person who was infected has fully recovered without any complications, reported close contact with swine the week prior to getting sick, and no human-to-human transmission has been identified. So, even though there is very little flu across the country, it does appear that this year’s flu vaccine is likely a good match to what will be the circulating influenza strains this winter. So, should you or your child get the flu vaccine? This is a tough question to answer, and a decision that only you can decide for yourself or your child. I typically recommend that patients with lung/heart disease or other serious chronic illness receive the vaccination. Apart from that, the decision really needs to be made on an individual basis. The flu vaccine is contraindicated for patients with severe egg allergy or life-threatening reactions after previous flu vaccines. Precautions should be taken in those who have experienced Guillain-Barre syndrome after previous influenza vaccination, and I would also say in patients who have a strong family history of other autoimmune or neurodegenerative illnesses. The decision to get the vaccine depends on what risks you, as patients and parents, are willing to take. While influenza infection tends to produce mild illness in most, it certainly can cause more serious and even life-threatening complications, especially for those populations considered at risk. I have cared for children hospitalized in the Pediatric Intensive Care Unit from influenza complications. On the other hand, no vaccine is 100% risk-free. I have also cared for patients who have developed serious complications after the flu vaccine, including multiple sclerosis and Guillain-Barre. Children who are most at risk for serious adverse vaccine reactions are those who have underlying “mitochondrial dysfunction”. These kids often have a personal history of delayed developmental milestones or family history of autoimmune illness, neuropsychiatric disorders like autism or ADHD, cancers, or other chronic illness. For these kids, vaccination is not necessarily out of the question. But serious adverse reactions can be mitigated by supporting mitochondria, methylation, and detoxification with supplements like coQ10, methyl-B12, glutathione, and homeopathic Thuja. I also don’t recommend shots when kids have any hint of a cold or illness coming on – if we’re asking our child’s immune system to mount an appropriate and effective response to the flu vaccine, or any other vaccine for that matter, why have their immune systems occupied with anything else? For most people, the flu will be relatively mild and without complications. The 2016-2017 flu vaccine does appear to be a good match for circulating influenza strains. The flu vaccine may be helpful in reducing the risk of actually getting the flu. Certain populations are more at risk for serious complications from the flu. Certain populations are more at risk for serious complications from the flu vaccine. Whether you decide to get the flu vaccine for your child is YOUR CHOICE – and the risks of your child getting complications from the flu must be weighed against the risk of your child getting complications from the flu vaccine. Only YOU can decide what risks you are willing to take. If you decide to give your child the flu vaccine, please make sure that they are in their best health. If you’re child has any risk factors for serious adverse reactions to the flu vaccine, then consider supplementing with coQ10, methyl-B12, glutathione, and homeopathic Thuja. There is NO right or wrong decision. By informing yourself, you are doing the best thing for your child and for your whole family. Trust your mama or your papa “gut”, and you will always do what is best for your child. Whatever you decide, using your natural medicines toolkit will get your whole family through the winter cold and flu season healthier and stronger, so be sure to read my blog posts Keep Your Family Healthy Through The Flu Season and Treat Your Child’s Flu – Naturally! I do hope that this has helped you in making this difficult decision for your child. Please share this with any parent you know who is struggling with this decision. I’m so grateful that you have allowed me to share in this healing journey to help your child thrive. Thank you! I totally needed to read/hear this! Hi Hettie – Vaxxed is an amazing documentary that yes, I think all parents should watch if they have the opportunity. Thank you for the reminder! We feel very fortunate to know Dr. Song. She’s tested our children and helped us understand what genetic risks we all have, and how best to handle illness and vaccines. I get very tensed up being a natural mommy herbal were i can as much as possible and my gut says no to any immunisation vacines. However i do live in a rural area in Transkei, South Afrika xhosa village, were kids all get injected have very low vitamin / right food source clean water all the time, and although their immunity seem very good i cant help to wonder if it wouldnt be better to get my Benji vaccinated since the whole heard is doing it and worried he will get virus from them and get very ill if his immune sistem cant fight it? We have no history of anykind of ilness in family accept for heart attacks , and benji had water on lungs after home birth. such a tough question! yes – proper immune health relies on adequate nutrition as a mainstay. and if there is no family history of autoimmune or other chronic heath concern, then there is also very little concern about serious reactions to the flu vaccine. As for getting the virus from those around him who are vaccinated, that would only be the case if the vaccine being used is the nasal flu vaccine spray. if the kids around him are getting shots, then they are getting the inactivated “dead” flu vaccine and there is no chance that he’ll get the flu from them. best of luck! Hi Dr. Song! So happy I found your site. I fret every year over whether or not to get my children vaccinated with the flu vaccine. My mother and I both have the autoimmune disease, sarcoidosis. Mine is a more mild form but my mother has significant lung involvement with hers. Both are chronic cases. Would this be a factor in vaccinating my children since the disease is likely genetic (though my kids have no symptoms or diagnosis)? Hi Krista – we are learning more and more about risk factors for developing autoimmune illness, whether “genetic” or not, and that some vaccines may be part of this picture. While I can’t determine your children’s unique risks of serious adverse reactions to the flu vaccine or make specific recommendations on whether you should or shouldn’t give them the flu shot, I would definitely encourage you to go to http://www.pubmed.gov and search for “ASIA” or Autoimmune Auto-inflammatory Syndrome Induced by Adjuvants. The other things to consider is that the flu shot this year is predicted to be less than 10% effective anyway, and the flu shot in general has a known higher risk for autoimmune reactions like Guillain-Barre syndrome. Hope this helps! Best of luck with your decision!